It was inspiring to a lot of people when the Revive NYSUT ticket appeared last year. Naturally, there were frustrations with NYSUT, and a few people I respect explained some of them to me. In fact, when I first saw them, I thought it might be a good idea. Like most UFT members, I had little contact with NYSUT, but I knew UFT needed a revival, so why not try this? It wasn't until weeks later I discovered that UFT leadership was actually behind this movement. I was recruited to run for Executive VP of NYSUT, and I traveled all over the state going to forums. I learned an awful lot about NYSUT. For one thing, it's clear new NYSUT leadership follows UFT in every way. UFT makes up 28% of NYSUT, but has a 34% voting bloc, because many locals simply cannot afford to spend a weekend at the NY Hilton. Therefore, they get no vote. Of course all UFT reps have signed loyalty oaths. They vote as Mulgrew dicates or risk not only a punch in the face, but also expulsion from the elite, invitation-only Unity Caucus and all the privileges membership entails. 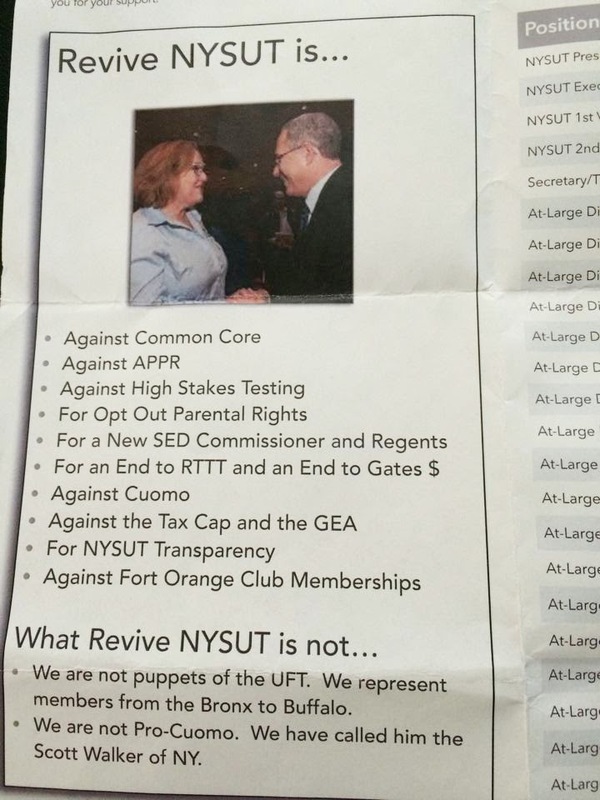 This is ironic because one of Revive NYSUT's biggest cheerleaders criticized the old leadership for belonging to the Fort Orange Club. NYSUT claimed membership was 15K a year, that the membership preceded their tenure for decates, and that the space was needed. Current Secretary Treasurer Martin Messner, in particular was vocally livid about this "perk." Not only this, said Messner, but NYSUT officers were taking first-class flights. He was gonna get to the bottom of this and make sure there was transparency, and no more perks! NYSUT could hold high-level meetings at Starbucks, suggested Revive, and save these crucial member dollars. Ya think they invited Cuomo to Starbucks to discuss endorsement plans? Here's the thing, though. It was tough to recruit people willing to run for NYSUT office. You see, the UFT has a deal with the city that while its members work union jobs, it compensates the city for salary. Full disclosure--I'm chapter leader at a large school, and I get one period off to take care of union business. I believe UFT covers 20% of my salary. For those who do more work, or even all work for UFT, their salaries are covered too. Even more full disclosure--I don't think it's a bad idea. Of course, I didn't run for office bitching and moaning that current officers had too many perks, were living like kings and lighting cigars with hundred dollar bills. In fact, I ran demanding representative democracy, saying there was precious little of it in UFT and that this model was not one we ought to emulate. I ran complaining about anti-teacher legislation, particularly APPR, Cuomo's punishing tax rule that districts need a supermajority to help kids, and Tier 6 pension. I was amazed to see the APPR labeled as an Iannuzzi bill, and that no one from Revive seemed to remember their staunch supporter Mike Mulgrew taking credit for it. Anyway, while NYSUT leadership can't oppose Common Core, while it can't oppose Cuomo, while VAM is still enshrined in law, and while pension is still severely diminished for members, it managed to quickly and quietly get legislation passed to make sure leaders Magee, Messner, and Pecorale have their pensions covered. Unlike Iannuzzi, none of them have thirty years in. Now NYSUT will make sure that if they resign or retire, or even if they get blackballed by Mulgrew, it will be like they were at their old jobs. When is Martin Messner gonna take a principled stand, resign his old job, and demand a salary cut from hard-working NYSUT members? When is he gonna protest that this bill was passed so surreptitiously and demand transparency? Personally, I suggest you sit while you wait for that to happen. This is hypocritical not only because they, particularly Messner, were so adamant about not taking perks and being transparent. It's also hypocritical because former Secretary Treasurer Lee Cutler was denied the transition pay that ex-officers receive, and NYSUT is fighting to make sure he doesn't get it. Not only that, but Cutler resigned from his position to work with NYSUT. Neither Magee, Messner, nor Pecorale are showing this level of commitment, even as they work to make sure Cutler isn't compensated. Current NYSUT leadership takes good care of current NYSUT leadership. You and me? Meh. Why do they support Common Core, despite explicity promising they were against it? Why do they support Jeff Klein? Why won't they oppose Governor Cuomo in favor of pro-teacher, pro-labor Zephyr Teachout? Why did Governor Andrew Cuomo sign a bill that protects NYSUT leadership when we have such a hard time getting substantive pro-education bills realized? Why is Tier 6 good enough for new members? I'll leave that to your imagination. You might also be interested to know that, far from a principled salary cut, NYSUT Board of Directors voted a 2% raise for officers, already making at least 250-300K or more. And why not? What does 250-300K even buy nowadays? I can't be sure. I only know it's a hell of a lot more than most working teachers will ever be able to afford.